The placenta is an amazing thing, we all know this if we’ve spent any time reading this blog. It is obviously essential for our babies existence and is extremely beneficial for a mother’s postpartum healing. But what else can that wonderful placenta provide? I am now reminded of the classic kid’s book by Shel Silverstein, “The Giving Tree”. Seems the placenta can just keep on giving! Idealy your placenta will be turned in to a print as soon as possible, and you can just use the blood to make the print. Many instructions recommend painting your placenta, and while that can offer a beautiful result, if you want to encapsulate it, best to just use the blood. It allows for a beautifully natural look. First, lay down your towel, place the placenta on it in a way that appeals to you. Some people like to make it look like a tree with the cord appearing to hold it up. How you place it is totally up to you. Run your hand over the placenta and cord, making sure the blood is evenly situated, and make sure the placenta is positioned how you want it. Next, remove your gloves and take a sheet of art paper and place it on top of the placenta. Gently rub your hands over the paper. Lift paper off of placenta and voila! 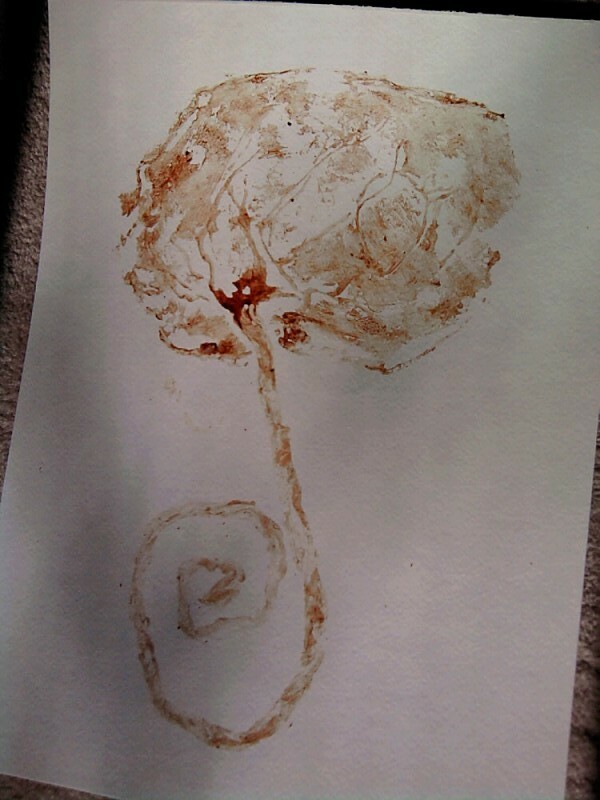 Placenta print! There are some videos on youtube that have instructions, this video is very easy to follow. Again, I would recommend just doing the blood prints when encapsulating. Once you have created your print, you can add paint to the paper, or leave it au natural, frame it and hang it! It will make a great conversation piece for your living room, or a wonderful addition to your baby’s nursery. Have fun!! And remember, be gentle with your placenta.